Super greens, nuts, healthy fats: you can cram lots of good things into a homemade jar of pesto. It'll keep in the fridge for a week under a thin layer of oil (or you can freeze portions in ice cube trays then pop out and store in freezer bags to reheat gently as instant pesto when you need it). Toss through hot pasta (little shapes like orzo can be ready in next to no time). Most kids are happy to switch-up standard basil pesto for one of these blends and they're very easy for little ones to make with you - just make sure they know not to touch the processor's sharp blades. Taste before spooning into jars and add a bit more oil, cheese or seasoning to get the blend you fancy. Blend 85g kale or watercress with 85g pine nuts, 3 tbsp Parmesan, ½ a small clove of garlic and 4 tbsp olive oil. Squeeze in lemon juice, salt and pepper to taste. Throw a handful of basil into the processor with 75g pine nuts, ½ a small clove of garlic, 2 tbsp olive oil and 4 tbsp Parmesan. Season with salt and pepper, add a drained 450g jar of roasted red peppers and blend. Little pasta shapes, like alphabetti or orzo, cook in minutes and are very easy for little kids to pour, stir up - and eat. This recipe uses ingredients that, nine times out of ten, you'll have knocking around in the fridge and freezer - a knob of cheese, a lone carrot, frozen peas. It's a proper get-out-of-jail meal for when you're low on groceries and the kids have just got home from school starving. Rough measuring in an old tin makes life easier - no need for scales. 1. Boil the kettle while you put the pasta and veggies in a small pan. Just cover with boiling water, stir and simmer gently for 3-4 minutes (or following packet instructions). 2. Meanwhile, grate the cheese (box graters are easy for small hands or try a rotary grater). 3. Drain any remaining water from the pasta, stir in the cheese and serve. Babies like this too - and it freezes well in individual baby portion plastic pots. Just thaw in the fridge then reheat thoroughly. If you've tried to make fritters in the past and got frustrated by them falling apart on you in the frying pan as you try and flip them, then it's time to get out your flat sandwich press and cook both sides at once. Sandwich presses are also an easier way for little ones to cook (although obviously you need to tell them to keep their fingers well away from the hotplate). They're healthier, too, as you only need a spritz of oil to stop the hotplates from sticking - no need for oil in a pan. A fuss-free batter, a can of sweetcorn and these are ready in the same time it takes to make a toasted sandwich. 1. Heat your sandwich press. Drain the can of sweetcorn. Mix together the polenta and cornflour in a bowl. Snip up the chives with a pair of kitchen scissors and chop up the spring onions (kids find this easier with kitchen scissors, too). 2. Beat the eggs then stir into the flours with the chives, spring onions and sweetcorn. 3. Season with a little salt and pepper then drop spoonfuls onto your sandwich press (you can spray it with a little oil to prevent sticking). Depending on the size of your sandwich press you'll be able to do them all at once or in two batches. 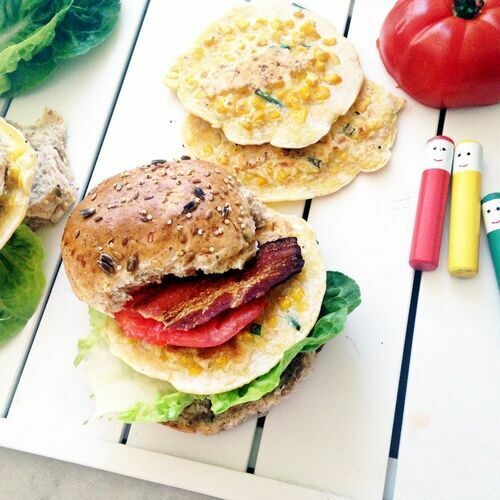 Serve in baps with salad and crispy bacon, if you like. This is a quick version for weeknights. Keep a watchful eye on little kids around raw chicken - don't let them touch it then put their fingers in their mouths and teach them that they need to wash their hands if they are the ones handling it and not you. It's best for adults to deseed the chilli if you're cooking with young kids - just talk to them about what you're doing and let them watch. If older kids are handling the chilli, remind them to wash their hands before rubbing their eyes. You can leave it out altogether if you want a no-spice version. 1. Preheat your grill and line a roasting tray with foil (saves on the washing up). Soak some bamboo skewers in water in the sink. 2. Get the kids to help you whizz up the sauce in a food processor: pop in the chilli (if using), peanut butter and the soy sauce. Peel and grate in the ginger and squeeze in the juice of your lime. Blitz - then add a little water, splash by splash, to loosen. It won't need much. You may need to stop the processor and scrape down the mix with a spatula before mixing again to combine thoroughly. 3. Snip up the chicken breasts using sharp kitchen scissors and skewer each one onto your soaked skewers. Cut the pieces small so that they cook quickly. Wash your hands and clear away the board and knife. Lay the skewers in the roasting tray and get them straight under your hot grill. 4. Pour the sauce into a bowl and scatter with the ripped-up coriander leaves and a drizzle of extra-virgin olive oil if you like. Grill the chicken for 10 minutes, turning on and off, then check. It may need an extra 5 minutes to cook all the way through depending on the size of the chicken pieces. 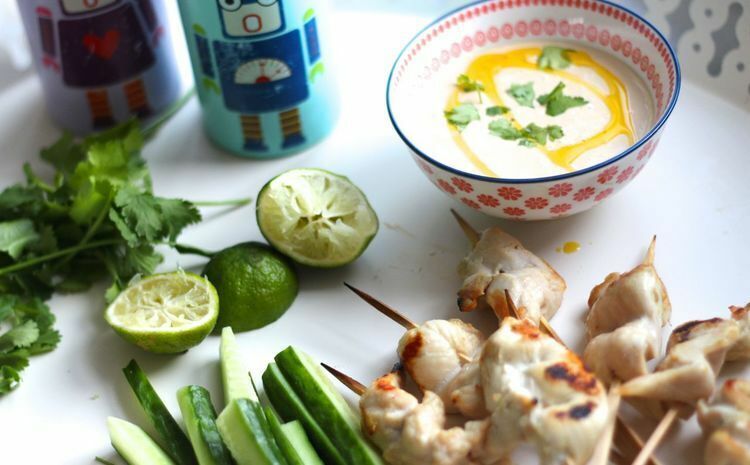 Serve with cucumber strips and the dipping sauce. Upscale toasties are the perfect use for the stray bit of ham, handful of button mushrooms or lone egg going begging in your fridge. Let your kids experiment by adding a nibblet of this or that and posh up your bog-standard lunch a bit. None of the below stray too far from tried-and-tested, kid-friendly formulas but should help encourage a bit of variation. All make enough for one decent-sized toastie. Break an egg into a ramekin. 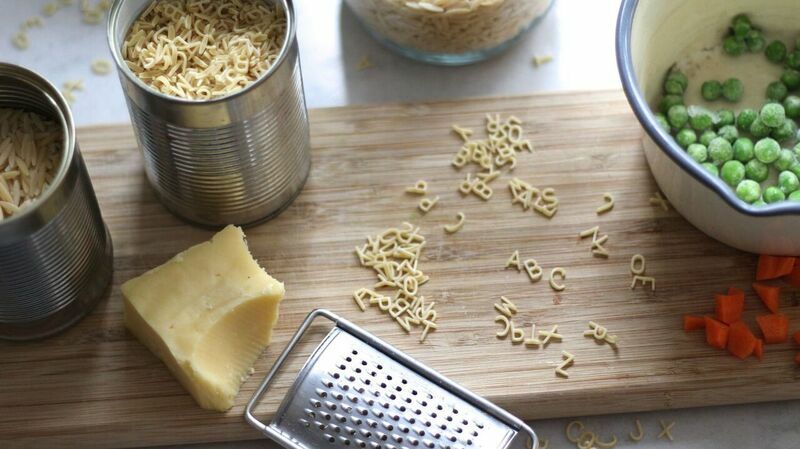 Grate a little cheddar (little kids find this easiest to do using a box grater). Layer a little baby spinach on top of your first piece of bread, making a little hollow in the centre (you will find this toastie easiest to assemble if you start it off by putting the first piece of bread directly into the sandwich press). 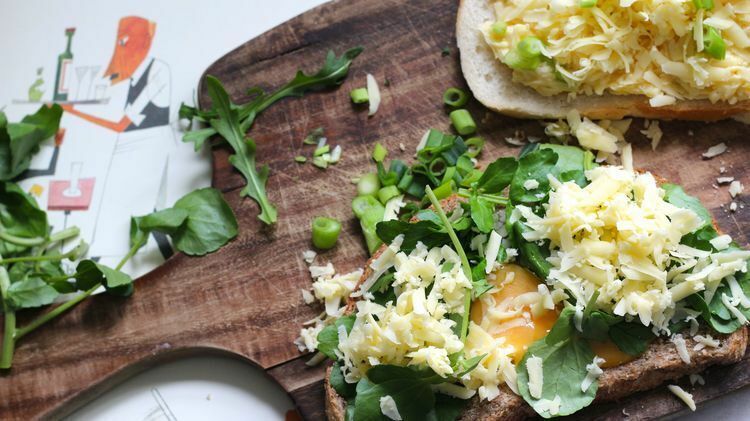 Carefully pour the egg into the hollow you have left in the slice of bread and top with the cheddar and a sprinkling of spring onions, snipped up with kitchen scissors. Top with the second piece of bread. Cook until the egg is oozing. Break an egg into a bowl and get the kids to whisk it with a fork. Add 200g grated cheddar, a spring onion snipped up with kitchen scissors and 1 tsp Dijon mustard and mix well to combine. Sandwich between bread and toast. Spread a little crème fraîche or cream cheese on your first piece of bread. Grate over a little lemon zest and black pepper and top with a few smoked salmon trimmings. Top with a few sprinklings of chive or spring onion, snipped up with kitchen scissors, then layer on your second piece of bread. Cook for a minute or two and the salmon will turn from raw to pink. Slice up a couple of button mushrooms and add to your sandwich with a couple of baby spinach leaves, a handful of grated cheddar, a slice of tomato and a snip of chives. If you have a little ham, get the kids to rip it up and add to the sandwich then top with your second bit of bread. If you have some thinly sliced chorizo or salami, you can use that in place of ham. Fancy trying any of these recipes? We'd love to get your feedback or see your photos! Post them to our Twitter or Facebook pages, or leave a comment below.